Congestive heart failure (CHF) is a condition in which the cardiac output is decreased due to heart disease. However, the kidney is intrinsically normal. 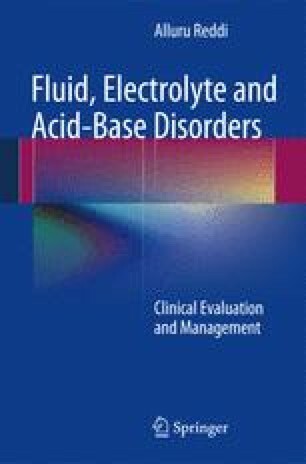 Despite a normal kidney, CHF is characterized by Na+ retention and extracellular fluid (ECF) volume expansion. Decreased cardiac output in CHF is due to both “backward” and “forward” failure. In backward failure, accumulation of blood in the venous system causes increased hydrostatic pressure and filtration of fluid into the interstitium. This eventually leads to a decrease in plasma volume. In forward failure due to a decrease in cardiac contraction, enough blood is not supplied to the tissues due to which, the kidneys cannot excrete Na+ and water normally. In high-output CHF conditions such as A-V shunts and beriberi, there is a decrease in peripheral vascular resistance due to shunting of blood from arterial to venous side creating a situation similar to that of backward or forward failure. In both low-output and high-output cardiac failure, decreased effective arterial blood volume (EABV) persists, and this “underfilling” then activates salt-retaining mechanisms and nonosmotic release of antidiuretic hormone (ADH). The effect of atrial natriuretic peptide (ANP) on Na+ excretion is attenuated. The major site for Na+ reabsorption in CHF is the proximal tubule. Plasma volume increases and cardiac output improves. If these mechanisms persist despite excess plasma volume, edema is formed due to altered Starling forces. Figure 7.1 shows mechanisms that promote Na+ reabsorption in CHF.